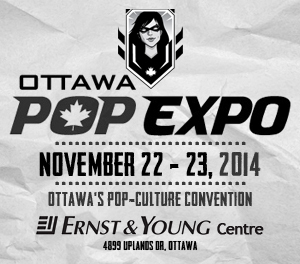 WIN FREE Sin City Swag from Diamond Select Toys! Diamond Select Toys is having TWO FREE giveaways on their facebook page! Up for grabs are a Sin City Flask Gift Set and a set of pint + shot glasses! A Diamond Select Toys Release! Sometimes, it’s dangerous to stay in one place for too long. Take your party on the road with this Sin City-inspired flask gift set, including an 8 oz. stainless steel flask bearing the Sin City logo, plus two stainless steel shot glasses and a stainless steel funnel to fill it with. Even the coldest alley will seem cozy when you have something warm in your belly! Comes packaged in a display box. A Diamond Select Toys Release! There are good shots and bad shots, but this is the best kind of shot! The dancers will look even prettier when you’re drinking out of this 2 oz. shot glass featuring the logo of Kadie’s Club Pecos, a popular watering hole in Sin City. Comes packaged in a full-color box. Getting over a bad break-up or an unsuccessful hit? What better way to drown your sorrows than in a pint glass emblazoned with the logo of Kadie’s Club Pecos? Just the sight of the Kadie’s logo (plus whatever’s in your glass) is enough to cheer the sorriest soul. Tip the bartender, or else. Comes packaged in a full-color box. Online retailers are now taking pre-orders for a new Diamond Select Toys Captain America Retro Box Set. The 1970s live again! The response to DST’s new Marvel Retro line has been overwhelming, as fans quiver in anticipation of getting their hands on reproductions of the classic Marvel Mego figures of yesteryear. Now, DST is proud to reveal the next Marvel gift set, featuring Captain America! A reproduction of the vintage Captain America figure comes packaged inside a reproduction window box, alongside two alternate heads, two all-new costumes and a variety of accessories. 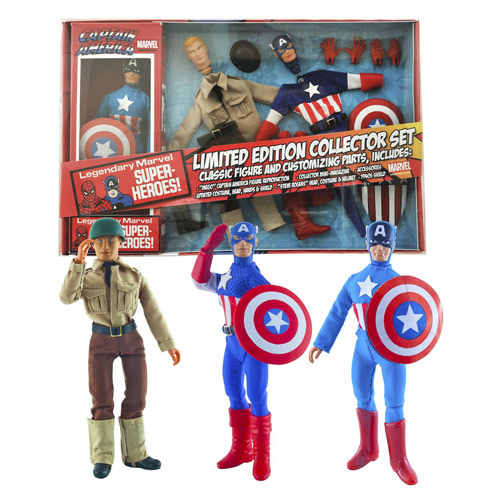 Dress your vintage Cap figure up as either World War II soldier Steve Rogers or a more realistic version of Captain America! Includes both the original and classic shields, as well as a booklet on the history of Megos! Set comes packaged in a deluxe gift tray. Designed and sculpted by EMCE Toys! Diamond Select Toys has revealed new Minimates based on films by Quentin Tarantino and Kevin Smith. The deities of the View Askewniverse have revealed themselves! As seen in many of Kevin Smith’s New Jersey films, dashboard icon Jesus Christ and fast-food mascot Mooby the Golden Calf are the two newest Minimates in the Jay & Silent Bob line. Packaged together on a blister card, each Minimate mini-figure stands 2 inches tall with 14 points of articulation, and features interchangeable parts. Designed and Sculpted by Art Asylum! The first Minimates based on Pulp Fiction, the star-studded movie that made Quentin Tarantino a household name, are here, and the first two-pack features hitmen Vincent Vega and Jules Winnfield in their iconic black suits! Each two-inch mini-figure has 14 points of articulation and features a variety of interchangeable parts and accessories, including pistols, hamburger, shake and the mysterious briefcase! Designed by Art Asylum! It’s been ten years since Quentin Tarantino put his own stamp on the martial arts revenge movie, and now the two-part epic is the newest line of Minimates min-figures! The first box set, based on the fight at the House of Blue Leaves, includes The Bride, O-Ren Ishii, Gogo Yubari and Sofie Fatale. Each 2-inch Minimates mini-figure features interchangeable parts and accessories, and all four come packaged on a blister card. Designed and sculpted by Art Asylum! This line of Minimates is about to get Crazy! Our first set of Minimates based on Quentin Tarantino’s Kill Bill started the battle at the House of Blue Leaves, and now we’re gonna finish it! This all-new box set includes four different Crazy 88 gang members, each with 14 points of articulation, plus interchangeable heads and hairpieces, to create different fighters from the film’s epic swordfight. Mix and match multiple sets to re-create the carnage! Packaged on a blister card. Designed and sculpted by Art Asylum! Diamond Select Toys have announced a new pair of Sin City figures based on the 2005 film by Frank Miller and Robert Rodriguez. These full-colored figures of Hartigan (played by Bruce Willis) and Marv (played by Mickey Rourke) are exclusive to Toys R Us stores. Sin City: A Dame to Kill is in theaters August 22, 2014. Diamond Select Toys has revealed new pics of Art Asylum’s Minimates Series 57, based on Marvel’s Guardians of the Galaxy film. This series will be split into two waves. According to Diamond, wave 1 is available now at Toys R Us locations and toysrus.com. Wave 2, which is exclusive to comic and specialty shops, is scheduled for release later in August. Marvel Minimates are the tiniest, coolest, most fun way to collect the entire Marvel movie universe, and the newest assortment is based on “Guardians of the Galaxy”! Each Minimates mini-figure is 2 inches tall with 14 points of articulation, and each pack of two Minimates comes with a variety of interchangeable parts and accessories. A Diamond Select Toys release. Designed by Art Asylum!